Sacagawea dollars were released in 2000 and honor Sacagawea, a young Shoshone woman who is depicted on the obverse of the dollar with her infant son, Jean-Baptiste, swaddled on her back. The obverse was designed by Glenna Goodacre while the reverse, featuring an eagle in flight, was designed by Thomas D. Rogers. 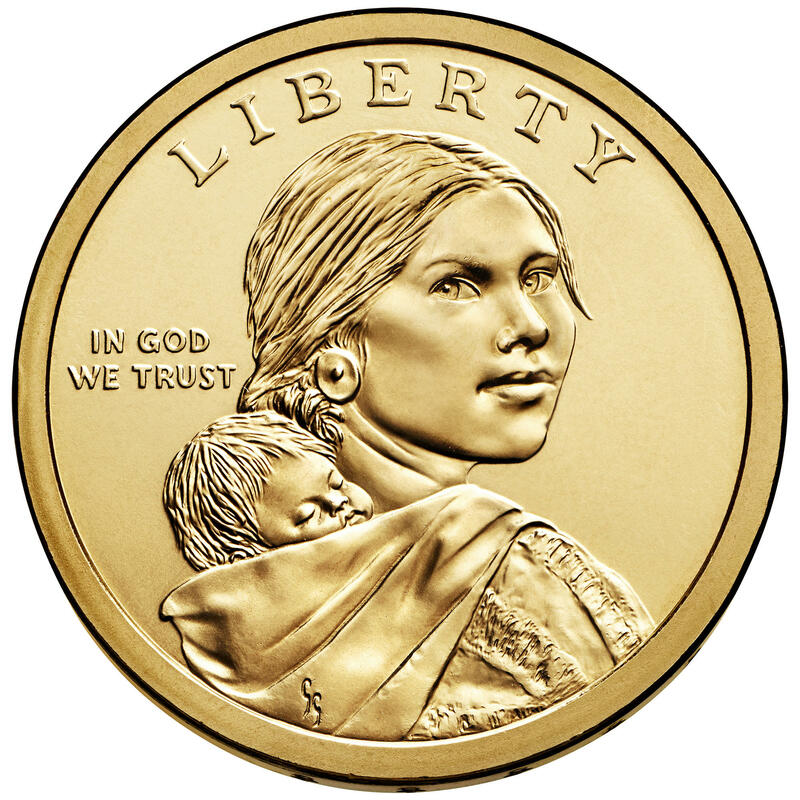 The Sacagawea dollar, colloquially referred to as the 'golden dollar,' is a small-size dollar coin made from an alloy of 88.5% copper, 6% zinc, 3.5% manganese, and 2% nickel. This, along with its round rim and smooth edge, makes the Sacagawea dollar distinctive in appearance from the Susan B. Anthony dollar, which failed to widely circulate. Despite much anticipation for success upon its release, the Sacagawea dollar failed to catch on with the public and never realized the circulation potential so many had hoped it could achieve. In 2009, the Sacagawea dollar series was replaced by the Native American dollar program. Native American dollars feature Sacagawea on the obverse of the coin and a new reverse each year showcasing various people, events, and symbols important to Native American peoples. The Native American dollar has a lettered edge with the date, mintmark, and motto E PLURIBUS UNUM.